Samsung's new blockbuster would indeed make long-time video enjoyment just a breeze. One thing I want to mention is that Galaxy S4, like its predecessors, only supports some specified video formats, like MPEG4, H.264, etc. On the other hand, as we all know, AVI is the most popular video format because of its high quality picture, compatibility with multi-operating systems and media players, so a great many videos come with AVI format. If you want to play AVI on Samsung Galaxy S4, you will be faced with a problem of how to convert AVI to Galaxy S4 compatible format. The following is an example. Actually, many Galaxy S4 video converters could help you out of the trouble. Here, I'd like to take MacX Video Convert Pro as example to tell you how to transfer AVI files to Samsung Galaxy S4 for playback easily. This top-rated Mac software can decode AVI to Samsung Galaxy S4 supported video format as easy as winking. You are also allowed to adjust the video and audio parameters to better suit your personal demand. You can easily transfer AVI files to Samsung Galaxy S4 for playback anywhere at any time. Tips: This is tutorial is especially provided for Mac users. For those who want to convert AVI to Samsung Galaxy S4 on PC, you could head over to the Windows version for help. 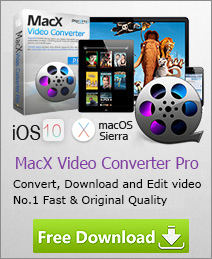 After free downloading and installing this AVI video decoder on Mac, click the "Add File" button to import source video. To play AVI on Samsung Galaxy S4, please select "to Android" and you can find the specific output format. Embedded with 420+video/audio codecs, this app also enables you to convert a wide range of SD and HD videos including AVI, WMV, MP4, FLV and MKV to iPhone, iPad, Surface, Nokia, HTC and more with stunning video quality for enjoyment. After finishing the above steps, hit the "RUN" button to start AVI to Samsung Galaxy S4 conversion. You can view the conversion progress or cancel the process at anytime.